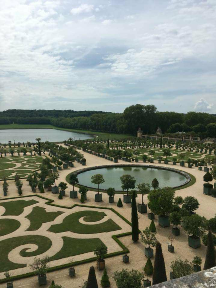 I have visited Versailles several times over the years but I have never time-travelled to arrive at the court of the Sun King with not a tourist in sight -until last Monday that is. My heart was in my mouth as I approached the golden gates, gowned and wigged appropriately of course as every courtier should be. 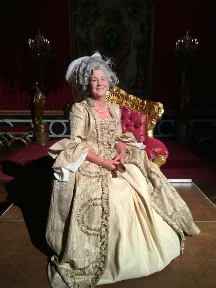 As I crossed the Cour d’Honneur I travelled back in time to a time of grace and elegance. Heels clicked as Ladies and Gentlemen, attired in rich silk brocades, made their way up the curving staircase to the rooms of the King. Chevaliers displayed their fencing skills; soothsayers predicted futures; experimenters shared new scientific knowledge, card games were played; musicians entertained; stately dances were taught and performed; champagne was drunk -a typical evening at Court, a constant parade of grace and beauty through State rooms to a breath taking view of the Hall of Mirrors . 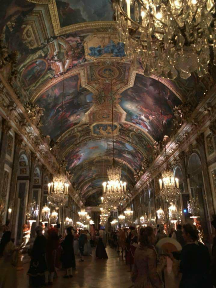 Ho visitato Versailles diverse volte nel corso degli anni, ma non ho mai viaggiato nel tempo fino ad arrivare alla corte del Re Sole senza un turista in vista - almeno fino a lunedì scorso.